While I wait for my Palmetto State Armory AR15 lower receiver I thought I might share something I have sitting in the safe. It’s is a Cavalry Arms (now Cavalry Manufacturing) lower receiver.There are many AR15 lower receivers on the market but one quick glance will tell you why this one is different. 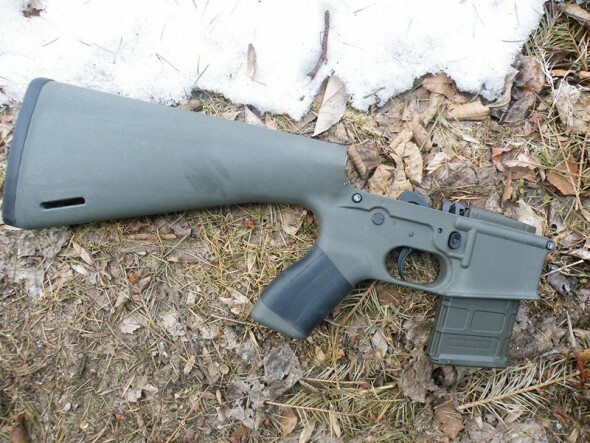 It can be considered the first successful iteration of the “plastic” AR15 lower receiver. Bushmaster’s Carbon 15 series never really gained much steam and other plastic lowers on the market are often looked at with the hairy eyeball… but the Cavalry lower came out swinging and showed the community just how durable a plastic receiver can be. don’t really know what to think of it yet. If you look closely you can see it is molded in two pieces and then welded together. in a variety (rainbow like even) of colors. drill into the hole to remove the excess plastic. necessary here to lower the high points on the inside of the mag well. release the contents of my buttstock to the floor. One more problem I noted is that the loose molding of the bolt hold open recess allows the catch to tilt back and forth. Such a tilt allows the bolt catch to miss the follower as in the photo below. This occurred while manually cycling the weapon. The bolt chewed into the follower rather than stop via the bolt hold open. I will have to shim this to correct the issue. reserve it for a secondary rifle project in the future if I can get comfortable with its performance. Eugene Stoner’s original M16 design weighed around 6.3 lbs. Today’s M16A4 weighs 7.4 lbs. This Cavalry lower is screaming for a M16A1 upper with pencil barrel. Do I smell a side project?